Trailhead and parking area are on Passaconaway Road in Albany, NH. From the junction of Rt. 153 and Rt. 113 in Conway, go north on Washington Street. In 0.2 miles, bear left onto West Side Road. Continue 0.7 miles, then turn left onto Passaconaway Road. The parking area is 3.2 miles down the road, on the right. It is 2.7 miles to South Moat on Moat Mountain Trail. Moat Mountain is the dominant mountain mass west of North Conway. It is the easternmost mountain on the main ridgeline of the Moat Range. Moat itself is a long north-south running ridge, with many peaks along the crest and many more spurs extending in all directions, including many of the cliffs above the far east end of the Kancamagus Highway. The three most significant peaks on the main ridge are designated as North, Middle, and South Moat Mountain and are all crossed by the Moat Mountain Trail. These three all have open rocky summits with spectacular 360-degree panoramas. South Moat is the easiest to access, and it is a scenic and very rewarding hike. Continuing to North Moat doubles the distance and increases the difficulty, so for the hike to both, see South and North Moat Mountains. The trail starts in an area of recent logging. The beginning of the trail has been relocated to avoid the logging landings. Leaving the far left corner of the parking area (rather than up the gated logging road), the trail winds through the forest near a logged clearing. It climbs around a small hill and descends to cross a brook, then switchbacks steeply up the other side, soon crossing an older logging road. Swinging around the hillside, the trail traverses across the slope, high above Dry Brook. At one mile, the trail descends to cross this brook on a wooden bridge. After a few short climbs and flat areas, the trail steepens and becomes rocky, soon entering forested ledges. It climbs moderately for a while before turning a corner to begin the steepest part of the trail. Several difficult and very rocky pitches lead to the first of the open ledges, 0.9 miles from the brook. Here, there is a good view south to the Ossipees and southwest to Mt. Chocorua. The trail now ascends mostly over open rock, with a few sections through the woods. Blazes may be difficult to follow on the ledges. The ledges may be occasionally slippery. It continues upward, with increasing views, first limited views to the southeast, then more open views to the east, south, and west. The trail steepens near the top and the views culminate in the amazing panorama from South Moat's summit. The views from the Moat Mountains are among the best in the region. To the west, you look out over the Sandwich Range and the valley of the Kancamagus Highway. 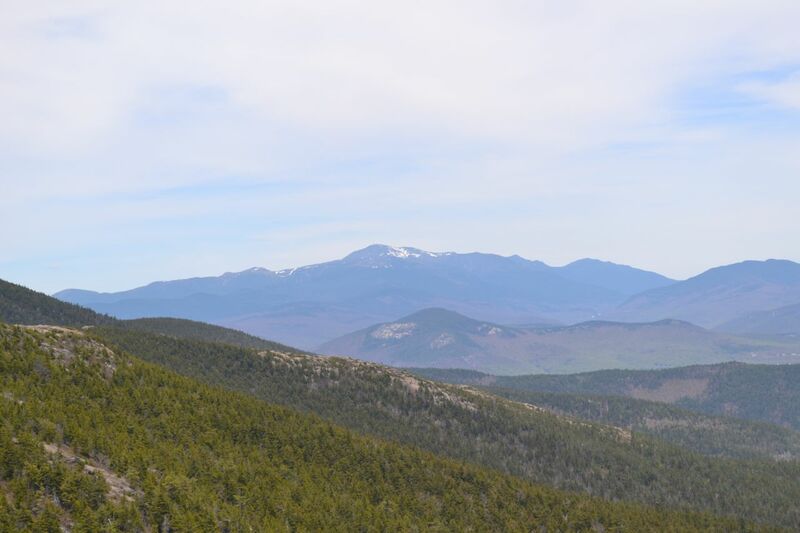 To the northwest, over the rest of the Moat Range, you look into the center of the White Mountains. To the north are Middle and North Moat. Just to the right of North Moat is the Presidential Range, with the Carter-Moriah Range to the right of that. To the east are the Baldface Range, Mt. Kearsarge North, and the Green Hills, with the flat expanse of western Maine beyond. To the south, the view extends far into southern New Hampshire.